Each and every one of us has a unique personality, consisting of all the little things that empower us, inspire and keep us going throughout the days and years. I am no exception. In order to be the best in tennis, I had to unlock so many different spheres of knowledge and apply them to my every day life. Welcome to the part of my webpage where I will share with you all the things I am passionate about. Here, you will get to know every aspect of me - up close and personal. “I was dreaming of becoming number one. Wimbledon was in those dreams. Then, in a span of just two days - my dreams came true. As the only player to win seven trophies in Melbourne, Novak has written a new page in tennis history. With a magnificent 6-3, 6-2, 6-3 win over second seed Rafael Nadal in 2019 Australian Open final, he surpassed Roy Emerson (AUS) and Roger Federer (SUI) in terms of all-time victories. 12 months since winning his latest ATP title (Eastbourne, July 2017) and after being sidelined for seven months with injury and recovery, Novak claimed his fourth Wimbledon crown. He beat Rafael Nadal in a titanic semifinal battle, and then defeated no.8 seed Kevin Anderson in the grand final – 6-2, 6-2, 7-6 (3). With 13 Grand Slam titles to his name, the Serbian star is fourth in the all-time list, behind Federer (20), Nadal (17) and Sampras (14). Novak claimed historic Cincinnati crown to become the first singles player to achieve Career Golden Masters. The Serbian star clinched his first Western & Southern Open title with a 6-4, 6-4 win over Roger Federer in the final. Three weeks later, Novak won his third US Open and 14th Grand Slam title with a 6-3, 7-6 (4), 6-3 triumph over Juan Martin del Potro in New York final. The Serbian star joined Pete Sampras in third place among Open Era major title leaders. Novak seized his 32nd ATP Masters 1000 title and 72nd career trophy, winning his fourth Rolex Shanghai Masters crown with a 6-3, 6-4 victory over Borna Coric in the final. Following a great week at the 2018 Rolex Paris Masters where he reached final, Novak returned to the summit of men’s professional tennis after two years. Novak successfully defended his Qatar ExxonMobil Open crown with a 6-3, 5-7, 6-4 victory over Andy Murray in Doha final to start 2017 season in perfect fashion. Novak captured his fourth grass-court title winning the Aegon International Eastbourne in his Devonshire Park debut. He defeated Gael Monfils 6-3, 6-4 in the final. Novak clinched his season-opening title and his 60th tour-level trophy overall at the Qatar ExxonMobil Open, beating Rafael Nadal in spectacular style, 6-1, 6-2. With his first crown in Doha, Nole became the 10th player in the Open Era to reach the 60-titles milestone. Nole re-established himself as the king of Melbourne when he claimed a record-equalling sixth Australian Open title in an astonishing final against Andy Murray (6-1, 7-5, 7-6). With 11 Grand Slam titles under his belt, Nole is now tied with Rod Laver and Bjorn Borg. Novak captured a record fifth BNP Paribas Open title in emphatic style as he defeated Milos Raonic 6-2, 6-0 in the Indian Wells final. The victory saw him draw level with Rafael Nadal on 27 ATP Masters 1000 crowns. Novak completed Indian Wells-Miami double for unprecedented fourth time with a 6-3, 6-3 victory over Japan’s Kei Nishikori in the Miami Open final. He became the new career ATP Masters 1000 titles leader (28) and all-time prize money leader on ATP World Tour. With his 63rd career title Nole tied Andre Agassi’s Miami tournament mark of six trophies. Novak clinched his second Mutua Madrid Open trophy when he beat Andy Murray 6-2, 3-6, 6-3 in the final, and again became the new career ATP Masters 1000 titles leader (29). On June 5, Novak won his first Roland Garros crown with a 3-6, 6-1, 6-2, 6-4 victory over Andy Murray in the French Open final. With the historic victory, the Serbian star completed a career grand slam and cemented his place among the game’s all-time greats. The Serb carved his name deeper into tennis’s history books, becoming the third man to hold all four major crowns at the same time, joining Don Budge (1938) and Rod Laver (1962 and 1969). Eight weeks later, Novak clinched an unprecedented 30th ATP World Tour Masters 1000 title with a 6-3, 7-5 victory over no.3 seed Kei Nishikori in Toronto final. Novak completed the 2016 season as a runner-up to Andy Murray at the ATP World Tour Finals in London (3:6, 4:6) and finished year as no. 2 for the second time in his career. Novak made history once again on February 1 when he beat Andy Murray 7-6 (5), 6-7 (4), 6-3, 6-0 to win his eighth Grand Slam trophy and become the first man in Open Era to capture five Australian Open titles. On March 22, Novak defeated Roger Federer 6-3, 6-7 (5), 6-2 in a dramatic BNP Paribas Open final for his fourth triumph at Indian Wells and 50th ATP crown. With a 7-6 (3), 4-6, 6-0 victory over Andy Murray in Miami Open final, Novak became the only man to win the Indian Wells/Miami title double for a third time. It is his 5th Key Biscayne crown. The world no.1 won his second Monte-Carlo title beating Tomas Berdych 7-5, 4-6, 6-3 in the final. He became the first player in history to win the opening three ATP World Tour Masters 1000 events of a season (Indian Wells, Miami, Monte-Carlo). Novak defended his Rome Masters title with a 6-4, 6-3 victory over second seed Roger Federer in the Italian Open final. On July 12, Novak claimed his third Wimbledon crown in a rematch of last year’s title clash. He beat no.2 seed and seven-time former champion Roger Federer in four sets 7-6 (1), 6-7 (10), 6-4, 6-3. With a simply outstanding performance, nerves of steel and heart of a lion, Novak defeated five-time former titlist Roger Federer 6-4, 5-7, 6-4, 6-4 to win his second US Open crown and 10th Grand Slam trophy. Novak captured his sixth title in Beijing with a 6-2, 6-2 victory over Rafael Nadal in the final of the China Open, extending his perfect run at the National Tennis Center to 29-0. The world no.1 won the Beijing-Shanghai double for the third time in his career when he defeated Jo-Wilfried Tsonga 6-2, 6-4 in the final to lift his third Shanghai Rolex Masters trophy. Novak claimed slice of Masters 1000 history with Paris crown. With a 6-2, 6-4 win over Andy Murray in the final, he became the first four-time champion in Paris-Bercy and the first player to win six ATP Masters 1000 trophies in a single season. Novak beat six-time former titlist Roger Federer 6-3, 6-4 in the 2015 Barclays ATP World Tour Finals title match to complete one of the greatest seasons of all time on the ATP World Tour. He became the first man in history to capture four successive season-ending singles titles and won a career-high 11th title of the year. Novak lifted his first trophy in 2014 in Indian Wells, winning the ATP World Tour Masters 1000 event for the third time. He beat Roger Federer in the final 3-6, 6-3, 7-6 (3). Two weeks later, Novak became just the second player to win the Indian Wells-Miami title double for a second time. He beat Rafael Nadal in the final (6-3, 6-3) to capture his fourth Sony Open Tennis crown. Nole won his third Rome Masters title and 19th Masters 1000 trophy beating Rafael Nadal in the Internazionali BNL d’Italia final – 4-6, 6-3, 6-3. In his second Roland Garros final, Novak fell to Rafa 6-3, 5-7, 2-6, 4-6. On July 6, Novak beat seven-time Wimbledon titlist Roger Federer 6-7(7), 6-4, 7-6(4), 5-7, 6-4 in spectacular final to win his second Championships crown. With seven Grand Slam titles to his name, Djokovic surpassed Stefan Edberg and Boris Becker and moved alongside the likes of John McEnroe and Mats Wilander on the list of all-time grand slam winners. Novak reclaimed the no.1 spot in the ATP Rankings on July 7, starting his 102nd week at world no. 1. On October 5, Novak won the China Open for a fifth time with an impressive 6-0, 6-2 victory over Tomas Berdych. The top seed displayed masterclass performance remaining invincible at the ATP 500 event with a perfect 24-0 record. Novak claimed his 600th match victory and 20th ATP World Tour Masters 1000 crown with a 6-2, 6-3 win over Milos Raonic in the BNP Paribas Masters final, becoming the fifth active player to reach the milestone (joins Federer, Nadal, Hewitt and Ferrer). Novak claimed his fourth Barclays ATP World Tour Finals title as Roger Federer withdrew ahead of final due to a back injury. He is the first player to win three straight season finale titles since Ivan Lendl from 1985-87. The only other player was Ilie Nastase from 1971-73. Novak has also clinched year-end no.1 spot for the third time in four years! Novak made history on January 27, 2013, by becoming the first man in the Open Era to win three successive Australian Open titles! He defeated no.3 seed Andy Murray 6-7 (2), 7-6 (3), 6-3, 6-2 and added the victory to his triumphs in 2008, 2011 and 2012 to tie the Open Era record for most titles in Melbourne with Agassi and Federer (4). Nole captured his 35th career trophy and sixth Grand Slam championship. Nole continued his run of form in Dubai, where he won his fourth Dubai Duty Free Championships crown. He beat no.3 seed Czech Tomas Berdych in the final 7-5, 6-3. Novak ended Rafael Nadal’s eight-year reign in Monte Carlo when he beat him in the finals 6-2, 7-6 (1) to win his first title at the ATP World Tour Masters 1000 clay court event, and became the only player to capture eight different Masters crowns. Nole won a record fourth China Open title with a 6-3, 6-4 victory over Rafael Nadal in the finals of the ATP World Tour 500 event in Beijing. A week later, Djokovic won his 15th ATP World Tour Masters 1000 trophy and second Shanghai Masters crown beating Juan Martin del Potro 6-1, 3-6, 7-6 (3) in the final. Nole became the 15th player in the Open Era to win 40 ATP titles, when he beat David Ferrer 7-5, 7-5 in the BNP Paribas Masters final. By defending his crown at the Barclays ATP World Tour Finals (b.Nadal 6-3, 6-4), Novak became the seventh player who won the year-end championship at least three times. In late December Novak captured his third Mubadala World Tennis Championship in a row, ousting David Ferrer in straight sets 7-5, 6-2. The ATP world no.2 maintained his unbeaten record in Abu Dhabi and became the first player to win three crowns. Novak began this season in a convincing manner at Australian Open, where he first prevailed over Andy Murray in a tough semi final match that lasted 4 hours and 50 minutes. Then he won against Rafael Nadal in the finals, in the encounter, which went on for six hours. It was the longest final match in the Grand Slam history (5 hours and 53 minutes). Novak received the Sportsman of the Year Laureus Award – the most prestigious sports award voted by the Academy consisting of the biggest sport legends of all time. The Republic of Serbia awarded him the top state honor in the country, “Karadjordjeva Star Medal”, for special merits and success in representing Serbia. Novak won Miami without losing a set – he beat Murray in the finals. With this success he joined Agassi and Sampras as the only players who won this tournament for three or more times. Furthermore, it was his 30th title in career, and 11th Masters Series title. In April, Novak was named one of TIME Magazine’s Top 100 most influential people in the world, following a phenomenal year in which he displaced Federer and Nadal at the top of the men’s game. Clay court season followed, with Nole playing finals in Monte Carlo, Rome and – for the first time in his career – at Roland Garros. At the end of May, Novak was appointed a global brand Ambassador of one of the world’s most prestigious brands, the Japanese clothing and sports equipment manufacturer UNIQLO. Nole maintained his standing atop the ATP Rankings for an entire year, putting together the fourth-longest run at no.1 since making his debut at the top position. He was stopped in attempt to defend his Wimbledon title, falling to eventual champion Roger Federer in the semi-finals. After the third Grand Slam of the season, Nole won the ESPY Best Male Tennis Player award for achievements in the past calendar year. At the London 2012 Olympics, Novak was a flag bearer for Serbia. In the bronze medal match he lost to Juan Martin Del Potro, finishing 4th. He successively defended his Rogers Cup title beating Richard Gasquet 6-3, 6-2 to lift the Canadian Masters trophy for the third time, and then finished runner-up in Cincinnati for the fourth time in five years. Djokovic reached his third consecutive US Open final at Flushing Meadows. He fell to Andy Murray in five sets in the title match. Two days after the USO, Novak Djokovic Foundation raised $1,400,000 for children at inaugural benefit dinner held in New York. Novak compiled a perfect 10-0 record clinching back-to-back titles in Asia, and by winning the Shanghai Rolex Masters, he became the first player to win seven of nine current Masters 1000 events. He saved five match points before defeating two-time defending champion Andy Murray, 5-7, 7-6 (11), 6-3 in a blockbuster final. Nole reclaimed the world no.1 ranking on November 5. He was awarded two exceptional honours for 2012 season: Arthur Ashe Humanitarian of the Year, which acknowledges outstanding humanitarian contribution, and ATP World Tour No.1 award (determined by South African Airways ATP Rankings). On November 12, he won the 2012 ATP World Tour Finals by defeating Roger Federer 7-6 (6), 7-5 in a dramatic final of the season-ending event in London. The Serbian star clinched the year-end no.1 ranking for a second straight year. He is the first player to finish no.1 in back-to-back seasons since Roger Federer from 2004-07 and the ninth player to accomplish the feat since 1973. Novak Djokovic had an impressive winning streak – 43 matches won in a row. There is no active player in the world that managed to achieve such a run. In his best shape, Novak arrived in London, for the Wimbledon Championships. There and then, in a span of just several days he fulfilled his childhood dreams. At the same time he lifted the Wimbledon trophy, and became the number one tennis player in the world. “I still think this is all a dream” – Novak Djokovic at the magnificent reception in Belgrade, where 100.000 fans greeted him. That year he had an impressive score against top 10 players, won 5/6 Master Series finals, won most titles at Masters 1000 tournaments in one season (5), and recorded most consecutive wins at Masters events (31). After London, Novak stepped up even faster: he won Montreal, and then the US Open – his fourth Grand Slam trophy. He climbed to the number 2 spot in ATP rankings, defended the title in Dubai, won the tournament in Beijing and reached semi-finals of Wimbledon and finals of the US Open. The most memorable moment of the season and the turning point in Novak’s career was the group effort of Serbian national team to clinch the Davis Cup trophy for Serbia for the first time in history. Novak, Viktor Troicki, Janko Tipsarevic and Nenad Zimonjic, led by team captain Bogdan Obradovic, beat the USA that year, as well as Croatia, Czech Republic and France, becoming the World champions. It was the greatest success of the Serbian team tennis in the history. As a confirmation of Novak’s enduring and devoted work, as well as his undeniable talent, the year of 2011 arrived. It was just a matter of time when “the golden year” would happen. Year of great achievements – ten ATP finals and five titles: Dubai, Beijing, Basel, Paris. However, Novak’s certainly most cherished title is the one he won in his hometown, Belgrade, where the first ever ATP tournament in Serbia was held. Djokovic was also runner-up in Cincinnati, Rome, Monte Carlo, Miami and Halle, which helped him finish the season as number 3 in the world, coming closer to No. 2 – a bridge to a dream come true. Novak won his first Grand Slam title – the Australian Open, beating Jo-Wilfried Tsonga in the finals and losing only one set throughout the whole tournament. After that success, he won another three big trophies – Masters tournaments in Indian Wells and Rome, and Masters Cup in Shanghai. Novak also won the bronze medal for his country at the Olympic Games held in Beijing. Season of Novak’s great success started by winning a title in Adelaide. Novak played quarter-finals at the Australian Open, semi-finals in Rotterdam, finals at the US Open and Indian Wells, which brought him to top 10. It was in Miami where he finally broke the reign of the two rivals, Roger Federer and Rafael Nadal. When he beat Nadal, Murray and Canas, and became the youngest player who conquered Key Biscayne, the entire tennis world realized that the new champion had come to the stage. A few weeks later, he won the Estoril tournament. He played semi-finals of Roland Garros and Wimbledon, and started the American tour by winning his second masters title in Montreal, beating the top three players en-route to the title: Roger Federer, Rafael Nadal and Andy Roddick. This trophy led him to number 3 in the world, which he held for 91 consecutive weeks – a truly remarkable tennis record. At the US Open he made his first Grand Slam final, where he lost to Roger Federer. Later that season, Novak secured Serbia’s historic place in the World group of Davis Cup competition, after which he won his 5th title in 2007, in Vienna. He won his first ATP tournament in the Dutch city of Amersfoort, from which his family, later on, bought the ATP licence for holding Serbia open tournament in Belgrade. Immediately after that Novak took another title in Metz. This allowed him to become the youngest player in the top 20. Novak Djokovic also played his first ever Grand Slam quarterfinal that year at Roland Garros. He finished the season ranked 16th in the world. 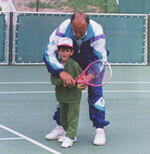 In the middle of the year he started working with tennis coach Marian Vajda from Slovakia. Year in which Novak turned his focus on playing bigger ATP events. In Australia, he qualified for the first time to play in the main draw of a Grand Slam. Later that year, he won another ATP challenger event in San Remo, after which he won his first round match at Roland Garros. He also qualified into Wimbledon main draw and reached 3rd round. The experience helped him move up the rankings and he entered the top 100 for the first time. He reached 3rd round at the US Open. In Paris Bercy, in his last tournament of the year, he beat Mariano Puerta, at that time the 9th player in the world, and reached the third round. This enabled him to finish the season ranked as no.78. He played for the first time for a national Davis Cup team in a tie against Latvia. At that time he was ranked 606th. He won a point for Serbia and Montenegro by winning against Janis Skroderis. Novak won his first ATP Challenger tournament in Budapest, where he started as a qualifier. He triumphed in Serbia F5 futures tournament and another ATP challenger event in Aachen, Germany. 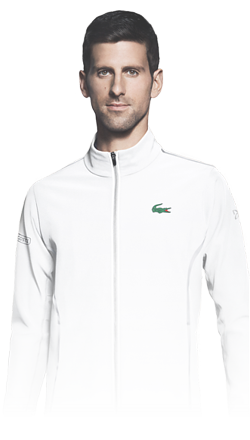 Novak Djokovic finished the season ’04 as 184th player in the ATP ranking list. The season began for Novak with the finals at the ITF tournament in Nurnberg. Djokovic then went on to win another gold medal for his country. In the French city of Latne he competed together with his teammates, under the leadership of a team captain Jovan Lilic, and became Europe’s best player under 16 years. Novak won six out of six matches he played. This year was a special year in Novak’s professional life. He also earned his first ATP points by winning at the Futures tournament hosted by tennis club “Red Star”. Novak Djokovic became the European champion in a category under 16 years. He won prestigious tournaments such as: “La Boule” and “La Poet” in France, Prince’s Cup in Miami under 18, as well as ITF tournament in Pancevo, where he beat rivals who were up to three years older than him. After five ITF tournaments he played, Novak became 40th best junior tennis player in the world. Golden year for, at that time, 14-year-old Novak. He ended the year as a triple European champion in singles, doubles and in team competition – while also winning the silver medal at the World Junior Championship in a team competition for Yugoslavia. While still in elementary school, instead of staying in schoolyard to play with other kids, Novak was running back home to get ready for his tennis sessions. Rain, snow or holidays – nothing could have stopped him from hitting balls with his tennis coach, Jelena. At one point, when he made an enormous move forward, Jelena advised Novak’s parents: “If you want him to keep progressing, he has to leave the country”. At that time, a difficult economic and political situation was looming over Serbia. The decision to let Novak move to Germany was difficult, but it was the only logical thing to do. 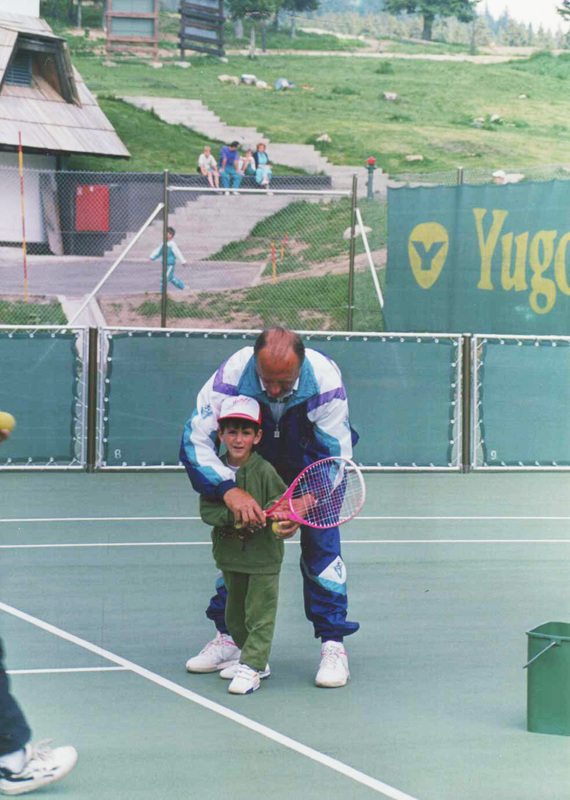 As a 13-year-old boy, Novak went to Munich, to train at the academy run by renowned tennis coach Nikola Pilic. During the next four years, Novak traveled from Serbia to Niki Pilic Tennis Academy to practice. The first year he went to Germany he stayed there for two months, then the next three months he was back at home in Serbia, and then again he went back to Germany for a month. Going back and forth as a way of living went on for some time until he started achieving great results on the court. Novak Djokovic took a racquet in his hands for the first time when he was four years old. It was summer, and one of the best tennis coaches, Jelena Gencic, was holding a training camp. Every day Novak came by and watched the trainings. Then, one day, Jelena invited him on the court. He accepted, and started playing tennis. Although he enjoyed skiing, and even football, it was tennis that won him over – as well as Pete Sampras whose game on the court Novak fully absorbed.